Karina's Kreations: Artistic Etchings Easel Card! 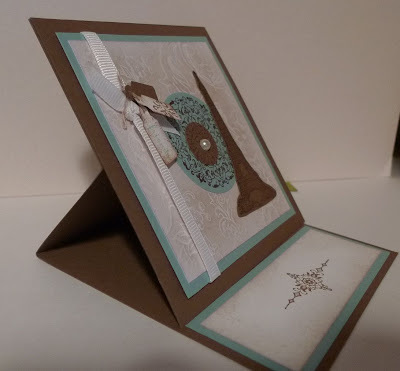 We made this easel card at my martini class using the Artistic Etchings stamp set. 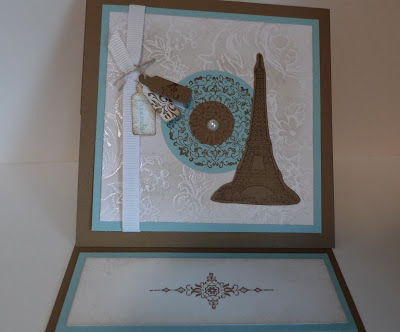 I started with Soft Suede 4-1/4" x 8-1/2" card stock scored at 2-1/8" and 4-1/4". Make a mountain fold out of the 2-1/8"score line. Place adhesive on only half of a piece of Soft Suede 4-1/4" x 4-1/4" card stock. Attach to the top part of the card base.